I picked up a couple of small foreign objects (a feather and a tiny rock) and they embedded in the bottom of my left foot in March 2017. Unfortunately, I contracted a MRSA infection from one or both of them. I was walking outside barefoot at the time. I didn't have any problems until Sunday, March 19th. Then, I came down with a GI upset, and then I had trouble getting my breath. My housemates got concerned and called 911. I don't remember anything from entering the ER Sunday afternoon until the morning of Wednesday, March 22nd. I was in an induced coma and intubated during that time. 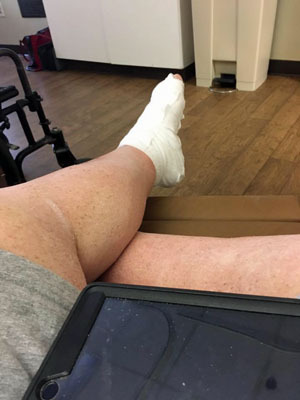 On Friday, March 24th, I was transferred in a wheelchair to a long-term acute care hospital across the street from the one I was in at the time. There were thunderstorms in the vicinity, but I didn't feel a drop of rain. In the long-term acute care hospital, I settled down to a routine of getting nebulizer treatments every four hours, heparin shots in the belly every six hours, cleaning the damaged left foot daily, and an IV of vancomycin in the wee small hours of the night. I didn't sleep worth a darn with all the interruptions. At least I had a PICC, which meant no further poking with needles for IV access. I had an iPad in the hospital to keep me occupied. One of my housemates commented that I'd be out of the hospital faster if they just cut off the damaged foot. I got out of the long-term acute care hospital Monday, April 17th. Came home and the air conditioning was dead. Fortunately, I got that taken care of the next morning. It wasn't that hot outside, but still I didn't sleep well that night. Probably wasn't used to sleeping without semi-constant interruptions from a balky infusion pump. Every Monday after then for the next two weeks, I went to the podiatrist's office. On May 1st, he decided to schedule me for surgery that Friday, Cinco de Mayo. No cerveza for me; I don't like it anyway! I was pretty worried about the surgery. I stayed awake until 3:00 AM and slept about four hours. During all this, I needed to change the Internet address of my Web site. I set that up in the morning, and headed off for surgery, getting to the hospital about 12:30 in the afternoon. The surgery was a piece of cake, the worst thing was having the IV started. The anesthesiologist said they were going to give something to relax me. A long hour later, my surgeon was telling me he was all done and the surgery was a success. There were a number of things (consent for a blood transfusion, medical directive to physicians, and my breathing machine at the ready) that we didn't need but we had just in case. My designated driver (one of my housemates) had gone back to the house, and I got to spend about fifty minutes in the recovery room. Both of my adult housemates came that time to bring me home. As far as I could tell, I had instantly recovered. But, when I got back home, I tried to figure out some Internet stuff and came to the conclusion that I should wait until the next day. I was pretty much out of commission until the 18th of May, but I went grocery shopping on the 14th of May early in the morning. I used a scooter in the store, had the bagger load the groceries in the Escape, and had my housemates bring them in. Fairly routine for me, I also have an arthritic knee. On the morning of May 18th, I went to see my podiatrist and he said that everything looked good. But I couldn't take a shower without a waterproof bag on my left foot until the 26th. Then, I could take off all the bandages and thoroughly scrub myself. The picture to the left was taken May 18th, showing off my stitches and the stuff they scrubbed me with during surgery. My last restriction went away on June 16th, when I could donate platelets again. Six weeks after the foot surgery, and I had returned to my normal activities of living. In August, all I had on my foot was a light pink scar line. The moral of this story is NEVER to go outside in bare feet! You can try barefoot running shoes, flip-flops, or sport sandals. There is a product that I (Charlie) want to try out, called NakeFit. It is a non-slip fabric pad that attaches to the bottom of your foot with pharmaceutical grade medical patch adhesive. They expect a pair to last for around a day.